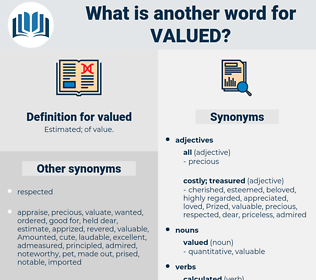 What is another word for valued? denominations, Qualities, Virtues, merits, ratings. Evaluations, calculated, useful, appreciated, congratulate, Congratulated, estimated, complimented, characterized, Investigated, hailed, loved, understood, acknowledged, Favoured, Applauded, Rated, Lauded, ruled, suggested, highlighted, Believed, delighted, cherish, emphasized, Regarded, felt, Saluted, considered, interpreted, Examined, placed, liked, commend, Commended, tested, stressed, Enjoyed, noted, Judged, Praised, Weighed, Thanked, recognized, Defended, determined, reasoned, accepted, welcomed, respect, respected, Viewed, added, Deemed, expressed, lay, Heeded, Looked, endorsed, Worked, marked, Concurred, Reached, Responded, Screened, conducted, Discussed, monitored, Insisted, put, eyes, owned, Greeted, constituted, Scored, studied, Wished, Took, wanted, thought, cost. valueadded, revalued, undervalued, valuated, accrued, valorised, validated, representative, calculated, Attributed, useful, underestimated, Benefited, elevated, measured, appreciated, Argued, Congratulated, estimated, Tabulated, COSTED, priced, treasured, articulated, Approximated, Appraised, Construed, Generated, benchmarked, assess, characterized, Investigated, categorized, hailed, Gauged, Aggregated, substantiated, loved, understood, Advocated, acknowledged, ascertained, Amounted, Capitalized, populated, preferred, Favoured, weighted, distinguished, pre-screened, perceived, Rated, Compared, Rewarded, Adjudicated, totaled, Totalled, quantified, showcased, balanced, calibrated, sold, ruled, underscored, analyzed, suggested, Contravened, Retrieved, Caught, recovered, Explored, developed, pursued, approved, analysed, Achieved, anticipated, Indicated, highlighted, delegate, forecast, Believed, Indexed, esteemed, identified, located, Upheld, represented, reported, cherished, maximised, reassessed, addressed, supposed, emphasized, assigned, upgraded, Regarded, derived, classified, credited, Accommodated, utilised, Dealt, concluded, assumed, felt, established, utilized, trusted, considered, interpreted, concerned, Examined, accredited, enhanced, charged, documented, recognised, inscribed, Undertaken, Surveyed, neglected, Computed, Lived, reputed, checked, pleased, placed, recorded, asserted, verified, liked, Commended, tested, note, reflected, Offered, spoken, prepared, stressed, featured, accomplished, reviewed, treated, described, researched, Titrated, attached, laid, accessed, Captured, observed, expected, predicted, included, Cher, collected, Reared, Enjoyed, Exported, exploited, earned, vetted, registered, noted, Allowed, Compiled, handled, Followed, Judged, encrypted, Assayed, Adhered, Praised, proved, proven, Weighed, detected, disclosed, Embraced, used, effected, Classed, renowned, Drafted, Enshrined, recognized, enrolled, Constructed, Borne, completed, fulfilled, determined, Inferred, Promoted, Pegged, received, depicted, owed, defined, accepted, Debated, welcomed, Prized, applied, specified, respected, set, ranked, honoured, Approached, listed, deferred, ignored, prescribed, sent, Grounded, projected, processed, maintained, built, Viewed, added, composed, Deemed, agreed, drawn, Been, expressed, seen, dear, attained, Performed, covered, Heeded, Looked, Housed, harnessed, Counted, voiced, conceded, obliged, desired, marked, Exceeded, Reached, CODED, intended, Screened, conducted, combined, tracked, Discussed, HIT, monitored, committed, granted, encoded, abided, Accorded, dumped, heard, sought, chosen, decided, put, Accounted, admitted, honored, Complied, enforced, held, pointed, taken, settled, cast, Entered, Greeted, Scored, Carried, rooted, studied, known, found, stated, focused, Mapped, satisfied, based, kept, founded, Bon, booked, risen, requested, fixed, bound, hosted, wanted, thought, Shown, done, Met, made. He hadn't a thing that she valued or needed. A further farm, valued at twelve thousand dollars, and also held in my name, is my friend's last gift to me, as I discovered by opening a personal letter which was to be kept sealed until this morning.